In our roles as Home & Family Maintenance Managers, we Real Women know how vital our morning routines are for keeping everything running like clockwork. Rise and shine to all family members by a certain time, take care of the family pet, make sure school work/lunches/briefcases/laptops etc are present and accounted for – the list is extensive, and we slip into drill sergeant mode to make sure all is in order before we head out for our day. Even my dog happily plays obedient soldier, prepared to go out and wait for the bus with my son, and ready to be rewarded with his “wubba” as I leave. That wubba is the most important feature of his morning. Nothing will go right in his world if it is forgotten. Similarly, on those mornings when there is a necessary break in the routine, we quickly adapt and persevere, but that break can throw us a bit off kilter. An over-sleeping child can mean the laundry doesn’t make it into the dryer, or a pet getting sick can mean a lunch gets forgotten, or no hot water can mean the laptop is left behind. These may seem incongruent, as if one thing shouldn’t have anything to do with the other, but trust us R.W.’s, in the world of routine, they are all linked. Just the other day I was talking with an R.W. co-worker, and she described how just the need to walk her dog at an earlier time than usual that day had caused her to forget her glasses. Yup, I totally get it. One way or another, however, we keep up the pace and we get out the door to face the rest of the day’s sequences. For those of us who travel to a job outside the home, there is a somehow comforting routine involved in the commute. No matter whether your commute is via mass transit, by foot, or by driving yourself, you see and do the same things every day. Over the past month or so, I have noticed an R.W. who passes by me, going the other direction, on the same road, at virtually the same point, every day. I’ve noticed her because she drives a yellow Jeep Wrangler, with the words “Country Girl” inscribed above her windshield. I wonder about her. Where is she going? Does she have a new job, because I hadn’t seen her up until recently? What kind of job does Country Girl have? I don’t think it is in Retail, since I see her at approximately 7:50am every day. Does she own a business? Does she have kids? Does she notice she passes me every day? About once a week, I will take an alternate route so I can treat myself to a stop at Dunkin Donuts. Yet even this diversion has a comforting level of sameness. All Dunkin Donuts smell and look the same. I know, with all certainty, that when I walk in, there will be a coffee klatch of older gentlemen in the corner, telling tales and discussing politics, sports, and local town news. I will step up to the counter and order the same thing: chai tea in the winter, a coolata in the summer. Often, I will run in to one of my R.W. friends there at the same time. She and I will chat briefly about our sons who are besties, then head off to our work places. Routine. When I take this alternate route, it brings me through something that our town owns as a badge of honor: one of the worst rotaries in the country. I’m not exaggerating. It was included in Ripley’s Believe It or Not. 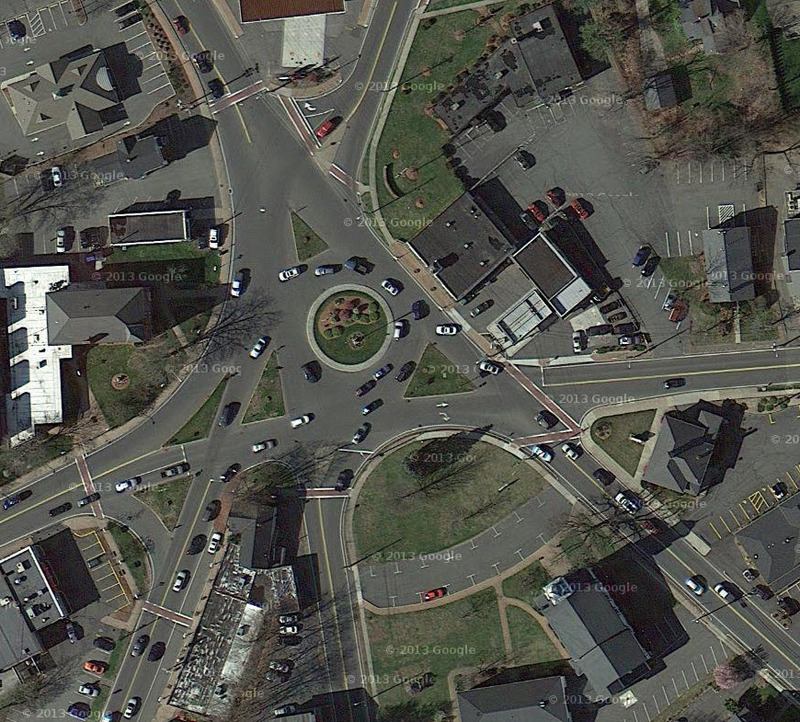 There are seven roads that converge in this spider web-like traffic circle. It was not designed for the faint of heart. Yet, somewhat miraculously, during commuter hours, all of the regulars who navigate this vortex on a daily basis cruise through and it all operates like a well-oiled amusement park ride. But on weekends or off hours, all bets are off. It is easy to pick out the rotary newbies, inching through with a look of terror on their faces. Or the elderly, who enter in a state of confusion and hope for the best. As a matter of fact, when we first moved here, our Realtor who was a spry and funny older woman drove us through the circle and proclaimed “I just close my eyes and go!” I’m confident this traffic configuration will never change. In 50 years, I expect it to look exactly the same. I view this rotary as a symbol of our routines and patterns in life. They may be messy and unorganized, or may not make any sense to anyone else, but when we can smoothly move our way through, we come out on the other side saying “ahhh, this is gonna be a good day.” When we have to make a change, or try something new, we get a bit scared and frustrated – yet somehow manage to make it through, relatively unscathed, thinking “huh, that wasn’t so bad.” And so it goes with our life’s order… when we are forced to make changes, we’ll often decide to embrace them, and make them part of a new routine, a new pattern. So in that spirit, I think on Monday I’ll try waving to Country Girl. Who knows, maybe we’ll develop a Good Morning Routine code salute. This entry was posted in Chores, family, Health, home, home chores, housework, Kids, real women, travel and tagged comfort, commuting, patterns, Reality, routines, schedules. Bookmark the permalink.